I LOVE being part of an online community of ladies who are like minded working on their fitness like me. Not to say we are perfect, we share our successes and struggles but we also follow the same meal plan and share recipes! One of the ladies posted a sweet potato pancake and I thought WOW what an amazing idea. Sweet potatoes are the most nutrient dense carbs you can eat. I am always looking for new ways to have them hence all of the recipes on here featuring them. This one deserves a special spot in your recipe collection! 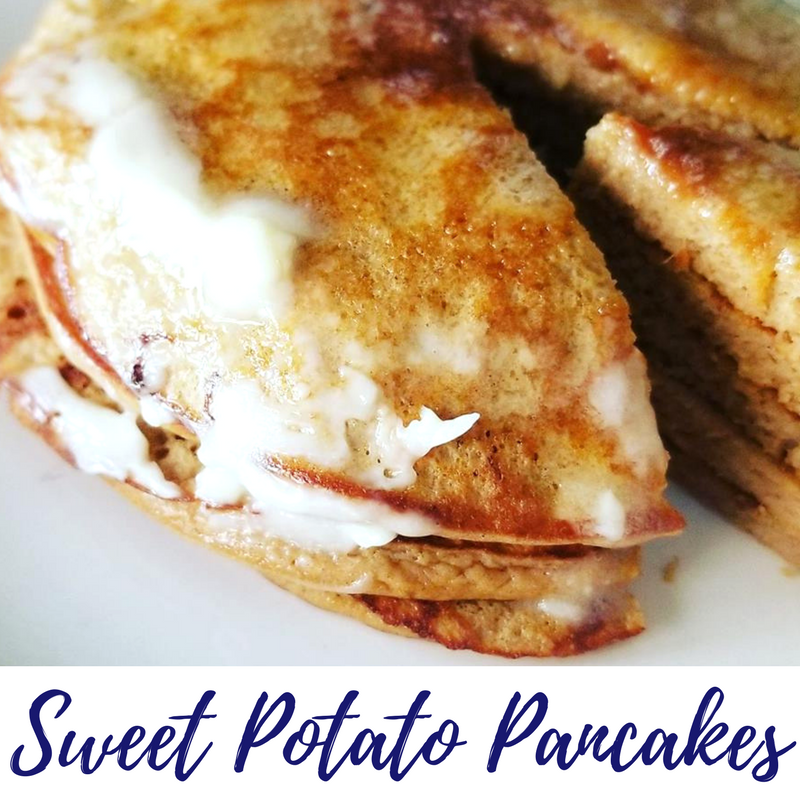 Kids and adults love them and if you would like to make these Sneaky pancakes you can absolutely add baby spinach to these and get in an extra veggie for you and the kids! These are sweet enough without maple syrup so for me it is just a teaspoon of melted butter on top... YES... butter is ok! We all need healthy fats. I know some people still can get past it but I promise...coming from the lady who lost 50 lbs and has kept it off real butter is ok to eat. If you are still eating butter from the tub PLEASE do yourself a favor and ditch it! With all the love in the world STOP. If it is man made I want you to think Chemical SH!T storm. K.... OK. I love to double this recipe because they go quick! This recipe serves 4 3-4 pancakes per serving depending on the size you make them! spray skillet with coconut oil spray or olive oil spray, then pour about 1/4 cup of batter onto skillet. These would be wonderful with sliced banana and drizzle of melted Almond or PB over them, and don't forget they can be sneaky by adding in that spinach which I often do because who doesn't need to sneak extra veggies in!